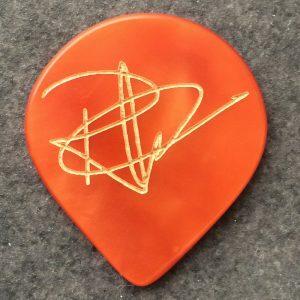 Richard Hallebeek signature picks are handmade and will help you achieve the sound and feel that inspires you. 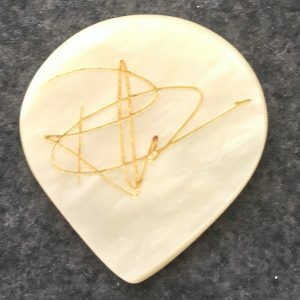 In search of that elusive big tone with a natural attack and a smooth compressed feel, Richard Hallebeek teamed up with Marco Bosch to finally design a pick that both felt comfortable to use and would shape the sound of the note into a tone with nice overtones and a smooth attack. Great care has gone into making each and every pick. The basic material is an aged polymer derived from a natural product and its properties are very similar to natural turtle shell. Particular care has gone into polishing so that you should encounter no resistance or strange plucking noises when picking the strings. There is a slight bevel at the tips which mimics the natural wear of the pick, as a result there is hardly any break-in period. 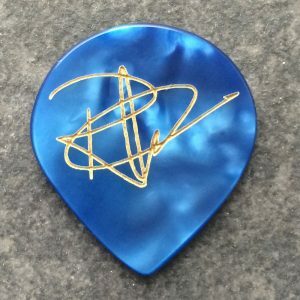 All picks are personally tested by Marco Bosch and Richard Hallebeek before they are shipped and you will receive a unique handnumbered certficate that is signed by both. – handcrafted in Germany, Europe; no waiting lists, fast delivery and extremely good pricing for a handcrafted and hand tested pick.